A new wave of tensions is underway between Serbia and Croatia, and in the Balkans as a whole. The main fuzz is going on about the alleged arms race between Serbia and Croatia that seems to be getting more and more serious by the day. But other hotspots—primarily Bosnia-Herzegovina and Kossovo-Metochia—are boiling too (or at least simmering). The outgoing Croatian Defence Minister Ante Kotromanović gave a statement essentially saying how Serbian PM Aleksandar Vučić should not be ‘nervous’ about Croatia getting American surface-to-surface missiles with a range of up to 300km. Croatian media and social networks at the same time started speculating which city in Serbia these about-to-be-donated missiles could reach. Serbian Ministry of Foreign Affairs strongly condemned Kotromanović’s warmongering rhetoric and the Serbian public, experts and media started to speculate on what should be done in an event of Croats actually obtaining receiving these missiles, which would greatly affect the balance of power between Serbia and Croatia. But as they say, where there is smoke, there is fire. This debate—accidentally or not—coincided with the visit of Russian Deputy PM Dmitry Rogozin to Belgrade. Rogozin’s main purpose for visiting Serbia was to see the details of Serbia’s wish to modernise its defence. He made a number of high level conversations between 9 and 12 January and was given a list of weapons Serbia wishes to obtain from Russia. He did not come empty-handedly. He presented a model of the famous Russian air defence complex S-300 to Serbia’s PM, commenting that if his hosts had one of those in 1999, no NATO airplanes would have attempted the aggression against the Federal Republic of Yugoslavia. This was a hint that Serbia might acquire these in near future. This gesture came as a prelude to Rogozin’s main political message to Serbian authorities and public: “Serbia is our ally in the Balkans”, and it would not be left alone if the rainy day comes. Undoubtedly, the vast majority of the Serbian society was happy about this visit, which was visible at the opening of the European water polo championship in Belgrade, where the crowd cheered with delight when Russia and Rogozin personally were mentioned, while just the opposite was the case for representatives of Serbian authorities. Needless to say, this visit did not please everyone. It was actually rather annoying for Western spectators (diplomats) and pro-Western part of Serbian government and the so-called civil society. The outgoing US ambassador Michael Kirby said that Serbia should not arm herself, while the most pro-Western minister in the Serbian government Zorana Mihailović gave an undiplomatic statement saying that Rogozin should mind his own country’s business. This came after Rogozin’s remark that Serbia should be cautious about the advice coming from the EU, as another Cologne might happen in Serbia if she is to blindly follow the EU. One thing is however certain – the visit was significant and it stirred the water in Serbian society. Simultaneously it showed potential Serbian adversaries, such as Croatia, that Serbia has a powerful ally. Republika Srpska made a grandiose celebration of its national holiday on 9 January (Saint Steven Day). Commemorating the day in 1992 when the Serbian members of the Assembly of then-Socialist Republic of Bosnia-Herzegovina (still within Yugoslavia at the time) decided to form Republika Srpska on 9 January 1992. These MPs made this bold step in reaction to the decision of Muslim and Croat MPs—made against the procedure, in the middle of night, without even informing their Serb colleagues—to organise unconstitutional referendum on secession, in which the Serb votes would be outnumbered, against the required consensus of three constituent nations. This referendum provoked a bloody civil war that ended only in 1995, with death toll of around 100 thousand. This year’s celebration happened in spite of the provocative decision of the Constitutional Court of Bosnia-Herzegovina to forbid Republika Srpska from celebrating it birthday. This decision was made by outnumbering of three foreign and two Muslim judges against two Serbian and two Croatian judges (such composition of this court clearly shows that Bosnia-Herzegovina never became a sovereign state), in an attempt of repeating 1992. Republika Srpska’s celebration however had the backing of the two of the guarantors of the Dayton peace agreement – Serbia and Russia. Serbia’s PM Vučić, accompanied by almost all ministers, was present at the ceremony and Russian ambassador in Sarajevo was there too, to show Russia’s support for Republika Srpska and its President Milorad Dodik, who is trying to preserve the Republic’s rights guaranteed by the Dayton peace agreement of 1995. Kossovo-Metochia has lately been in a state of unrest, but this time because of the conflict among ethnic Albanians. Ultra-nationalist opposition led by the Self-Determination movement continues their violent protests in Prishtina, the capital of this NATO-occupied Serbian province. 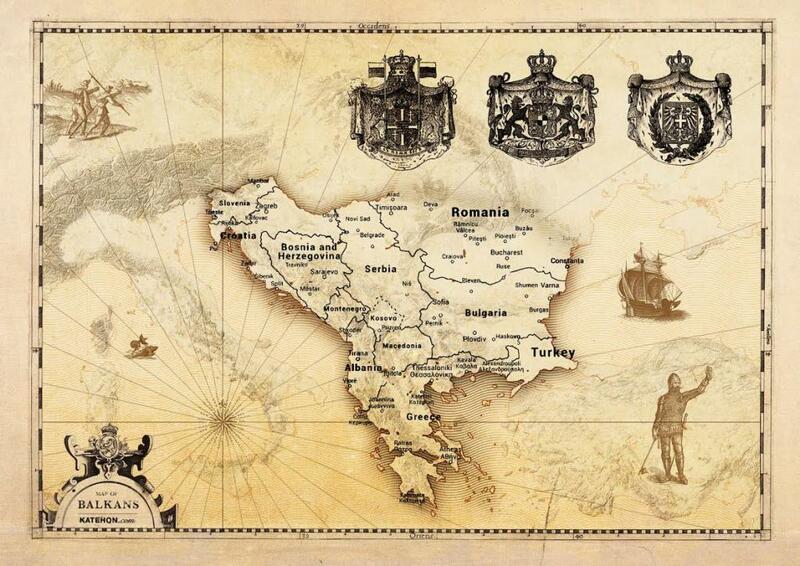 The demands were as usual, for the separatist ethnic Albanian authorities to stop negotiations with Belgrade. They are especially against the formation of the so-called Community of Serbian Municipalities of Kossovo-Metochia, brokered in EU-mediated Brussels Agreement. The latest protests were more violent than usual. Even Molotov cocktails were thrown at government building. Besides shouting the usual anti-Serb slogans, a group of protesters went to the unfinished Serbian Orthodox church in central Prishtina (this almost finished church building was abandoned after NATO occupied the province in 1999) to desecrate it by urinating inside. This is not only offensive, but especially ironic in the light of the recent unsuccessful attempt of ethnic Albanian separatist leadership to become a member of UNESCO, which would have essentially given them the right to ‘take care’ of the Serbian cultural heritage, including the churches on UNESCO’s Endangered Heritage List. Yet another interesting thing happened during the last demonstrations. Some of the protesters were shouting “Allah Akbar”, which indicates another underlining intra-Albanian conflict, the socio-religious one. The old Albanian Muslim clans follow the Bektashi stream of Sufi Islam. Most of the warlords (today’s politicians, drug-lords) come from Bektashi clans and families. At the same time, many of the poor Albanians are attracted to the Salafi-Wahhabi movement and many have fought and died in Syria. Some are still there and there are rumours of some returning. It would not be a surprise if the conflict between these two groups of Albanians escalates at some point, as since it is not only religious but social too, which may be a lethal combination. After Moscow – has everything suddenly changed for Serbia?